Follow these simple pool cleaning tips to keep your pool in good shape all year round! Taking care of your pool does not stop after installation. You must regularly maintenance and clean your pool in order to keep it in good shape for the entire season. Cleaning your pool can be a time-consuming process, but can be made pretty simple if you keep up with it. Here are four simple pool cleaning tips. A lot of pool owners will focus on the pool’s water and the bottom of the pool. It can be easy to forget about the edges of the pool when you can’t always see the build up right away. However, the edge of the pool needs to be cleaned on a regular basis to avoid having a layer of grime that is hard to get rid of. They have tools available that are specifically made to scrape across the side of the pool and get any dirt and grime off of it. Doing this regularly will keep you from having to do a time-consuming, deep clean in the future. 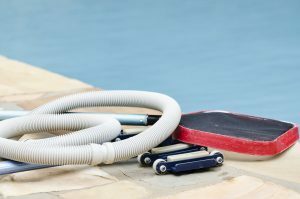 Pool vacuums are an essential pool accessory to have and really make pool cleaning a lot easier. Vacuums are pretty affordable and are easy to use. You just have to plug it up and vacuum the bottom of the pool just as you would your carpet. An automatic vacuum will easily pick up any dirt and debris that accumulated on the pool floor. This simple step will save you from having to buy extra products to clean the pool later and help to prevent potential algae build up. This is a routine that should be done daily when your pool is in use. An open pool is bound to collect leaves, bugs, and other various debris from the outdoors. Leaves actually affect the pool chemicals because they absorb the chlorine. For this reason, you want to use a pool net to get rid of leaves and anything else that is on the pool’s surface. Also be sure to empty the skimmer basket regularly because debris will accumulate quickly. This is something that only needs to be done a few times a year, but it is very effective at keeping the pool clean. You want to add some fresh water to the pool every now and again to help reduce the amount of salts and metals in the pool such as iron, copper, and chloride. If concentration levels of these elements get too high, it can cause brown stains to form in the pool. Adding 3 to 5% of the total volume of water to the pool a few times a year is a simple way to assure that your pool stays clean. This entry was posted on Thursday, August 9th, 2018 at 4:34 pm. Both comments and pings are currently closed.